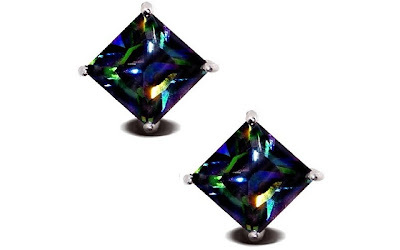 These .75 Carats Rainbow Peacock Topaz Square Princess Cut CZ Basket Set Silver Stud Earrings are currently selling for just $12.99 on Amazon.com! You will be saving 68% off the listed price of $40.00 with this jewelry deal. These rainbow CZ earrings are also available in 1 carat, 2 carats, 3 carats, 4 carats and 5 carats, but the prices will vary depending on the carat weight.